The origin of curry, the saucy, spiced dish celebrated in India and Great Britain, is not exactly known. But it is now thought that similarly spiced dishes were developed concurrently, but independent of each other, in England and in India thanks to the spice routes that spanned from Asia and into Europe. Exotic spices like turmeric and pepper made their way into England during the conquests of the Romans in 40 AD and the Moors in 711 AD, and came in handy during Middle Ages when highly seasoned meats could make aging meat more palatable. Curry powder, the crafted spice blend, however, is an 18th century English invention developed as a cooking convenience. 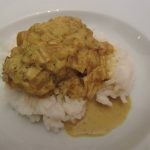 During the time of James Smithson, curry the “Indian way” became a culinary trend influenced by the British colonial interests in India via the East India Company. 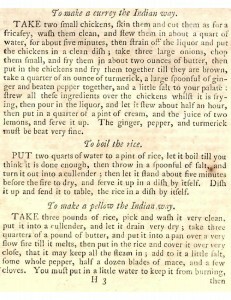 The first printed recipe, or “receipt”, for curry was published in the 1747 edition of The art of cookery made plain and easy, by Hannah Glasse. It included only pepper and coriander seeds, with the rice added during cooking. The more iconic spices of ginger and turmeric were introduced in the 1751 4th edition. In the 1770 “new edition” (held in James Smithson’s own library), the coriander is omitted and the rice is separated out as an accompaniment. Even though Glasse plagiarized 342 of the 972 recipes in The art of cookery, it was amusing and clever in its lauding of the use of simple ingredients and methods. And her recipe for curry maintains that philosophy. Here I’ve adapted the 1770 version, halved it, and translated where necessary. Additionally I’ve included Glasse’s companion recipe for boiled rice. Both recipes were incredibly easy (granted I didn’t have to kill my own chicken, grind my own spices, or pick stones of dirt out of my rice *as well as* benefiting from the use of onion goggles!). My husband, who is not a curry fan, and I enjoyed it immensely. He even ate the leftovers, which he never does. I also took the liberty of deviating from my culinary re-enactment and added some mango chutney on the side. Tasty! 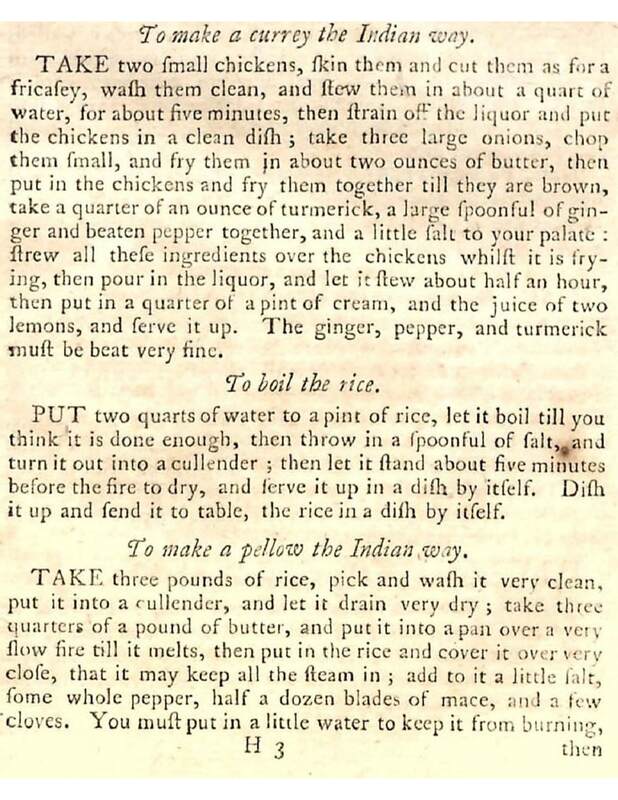 Glasse's 1770 recipe for curry. Mix turmeric, ginger, pepper, and salt. Put aside. In large pot, bring water to boil then add chicken pieces. Bring to simmer, cover (reduce heat further if necessary), and stew (i.e. fricasey) for 5 min. Strain off and save broth (i.e., liquor). Put chicken aside. Heat a large, wide, heavy bottomed cooking pan over medium-high heat. Melt butter, add onions, and sauté them for about 3 min. Add chicken to onions and fry together until onions and chicken begin to brown, about 3-4 more minutes. Sprinkle (i.e. strew) spice mix over chicken. Stir quickly to coat chicken pieces. Add broth. Stir and scrap any brown bits off the bottom of the pan. Bring to simmer, cover, and stew for about 30 minutes. Remove lid. At this point the broth should be well reduced, but the onions should still appear wet. Stir in cream and warm through but do not boil. Remove from heat and add juice of one lemon. Serve with boiled rice (see recipe below). Bring water to boil (this sounds like a lot of water, but it’s not for a rapid boil). Stir in rice. Boil 18-20 min. uncovered on med-high. Boil should be aggressive, but not raging. Test for doneness at 18 min. Remove from heat and stir in salt. Turn rice into colander and let sit for 5 min. Very interesting post; makes me to want to cook! Lilla, Hannah Glasse would be happy to hear you say that, she wanted to make cooking so easy that it was a pleasurable chore! Interesting post. 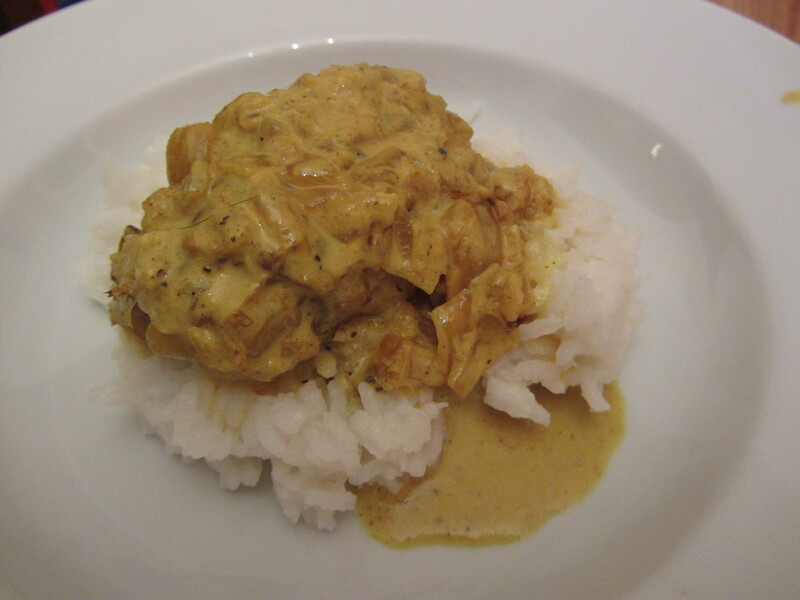 When and where was coconut milk added to the curry sauce?